A 10min walk from MRT Elephant Mountain Station, or right next to the bus stop for the 20, 33, 46, 88, 88 Shuttle. 207, 277, BL10 and XinYi Main Line bus. It’s definitely hooked up on transport! The inside has been designed by highly skilled and decorated Taiwanese artist Pili Wu and goes with a simplistic and elegant approach. The open bar area makes it feel welcoming and open, whilst the decorations below make it immediately obvious that it’s a tea shop. This is kind of confusing, on the first inspection. It goes immediately against the traditional approach to tea. What is this apparent scientific contraption doing in this tea shop? Above is the result – carbonated tea! And how damned cute are these double walled tea cups? So how is this different to any other carbonated tea out there? Well, there really aren’t many carbonated tea options out there, to be honest. But, what Guen Lung Tuan have done, I feel, has set the bar really high from the start. The owners are a man and wife combo who created this brand due to the wife not drinking alcohol. She was fed up of the same boring options available when out for drinks with friends. So, her husband (coming as the 4th generation from a tea farm in Nantou) tried to create carbonated tea for her, giving the effect of a more high class drink, but without the alcohol. 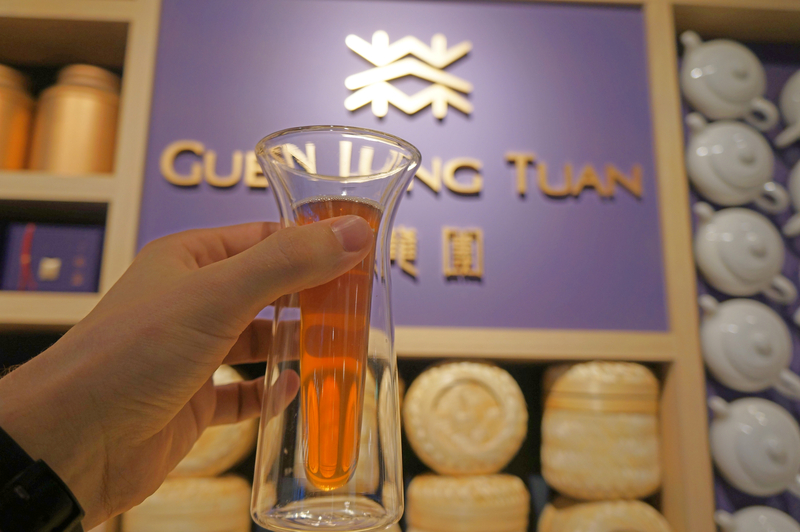 What makes Guen Lung Tuan so special? 8 years. That’s how long it took the owner to create his own machine which could, within 40 seconds, make 100° tea go to a chilling 6°. Whilst it sounds simple, in essence, it is anything but! But people love cold brew tea, why not just do that, instead? Tea, like anything else grown outside, can become contaminated at any given time with a whole host of different pesticides or the like. So, by using 100° water in this way to brew the tea, you’re all but guaranteeing the destruction and eradication fo anything on the tea leaves, but whilst getting the cold-brew effect. They’re not all about this cold brewing method, though. And, if you ask them nicely, they’ll get some hot tea on the go for you. Done in the coffee pour-over method seen here, we tried the DongDing Oolong tea from the families tea farm in Nantou. It was delicious, refreshing, smooth, and moreish. Whilst this is a tea shop, they also look to pair the tea with food for you, too. I am always down for food, literally, so this was a win on my behalf. Whilst they don’t make the food on site, it still tasted fresh and was a hit, I felt. We had pie, a croissant filled with pork and pineapple, dates filled with walnut and macadamia nuts, and also a couple of slivers of the infamous Taiwanese mullet fish roe. Delicious tea, fun concept, and beautiful store. I highly recommend this space.